Twenty-four years ago USA Hostels opened its doors to the world’s travelers by offering affordable accommodations in four California destinations: San Francisco, San Diego, Hollywood and Ocean Beach. Since then, they have received many industry awards and top rankings by Hostelworld, Hostelbookers and Trip Advisor. Among their hospitality achievements, Orwak believes USA Hostels also achieved “five gold stars” for their creative waste management and recycling solutions. For over a decade, USA Hostels avoided unnecessary waste, maximized recycling rates and reduced waste removal costs. They did it through precycling, recycling and in-bin trash compaction. If you have ever used your own bags, water bottles or bins, purchased digital media instead of physical DVDs, bought in bulk or purchased items packaged in recycled material, or no packaging at all, you have participated in precycling. Precycling is way to reduce waste by not acquiring it in the first place. By allowing guests to share or rent items instead of buying them, by purchasing food and drinks for the hostel in bulk and by using reusable containers in and outside the premise, USA Hostels actively practices precycling as part of their day-to-day operations. It’s common knowledge that recycling diverts large volumes of materials like glass, plastic, paper, cardboard, and other clean, source-separated materials from the waste stream. Businesses of all sizes are encouraged, if not mandated, to participate. In-bin trash compaction means trash is compacted inside of a 65 or 96 gallon bin to minimize volume. To achieve maximum compaction ratios, commercial equipment like the Orwak Flex 4360 is used. The result? Less bins to put out, less bins to pick-up by trash haulers. 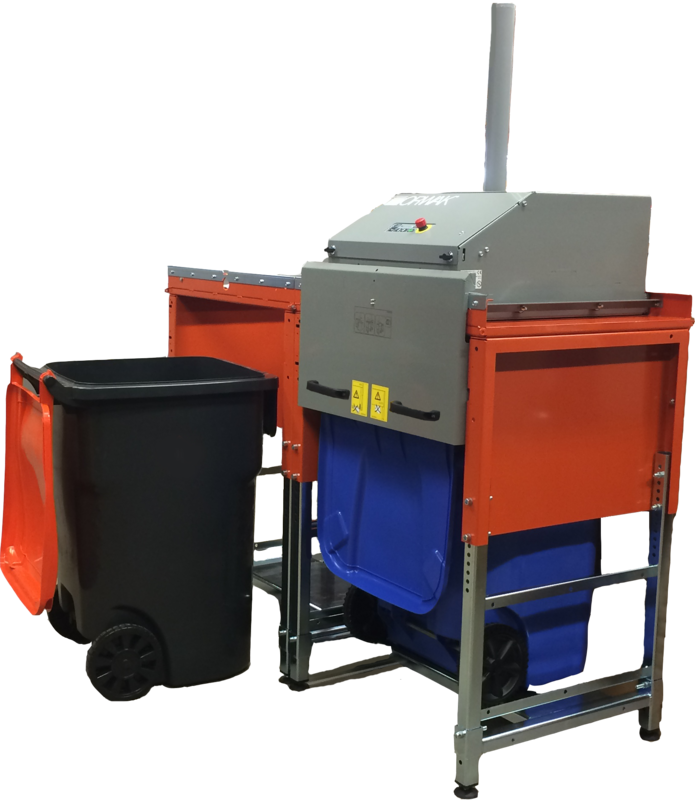 For businesses, in-bin trash compacting translates to lower trash removal costs, less bins to manage within the facility and more space. In general, trash compaction prepares waste for efficient transport by truck, boat or rail car to landfills or other waste disposal facilities. Compacted trash also takes up less space in landfills, thereby helping to extend the life of the landfill. With the help of Orwak’s LE in-bin trash compactor, USA Hostels was able to reduce the number of bins they put out for pick-up at each of its four locations. This lead to over a decade of savings for them and transportation efficiencies for haulers. Even with precycling and recycling practices in full throttle, back in 2008, USA Hostels was spending, on average, $4000 per month to have trash picked up at each of their four locations. Since each location put out four 96 gallon bins on pick-up days, they estimated they were paying about $1000 per bin for trash removal or $16,000 per month. This is why USA Hostels made the decision to purchase four Orwak LE in-bin trash compactors – one for each location. As a result, they immediately cut trash removal costs in half. 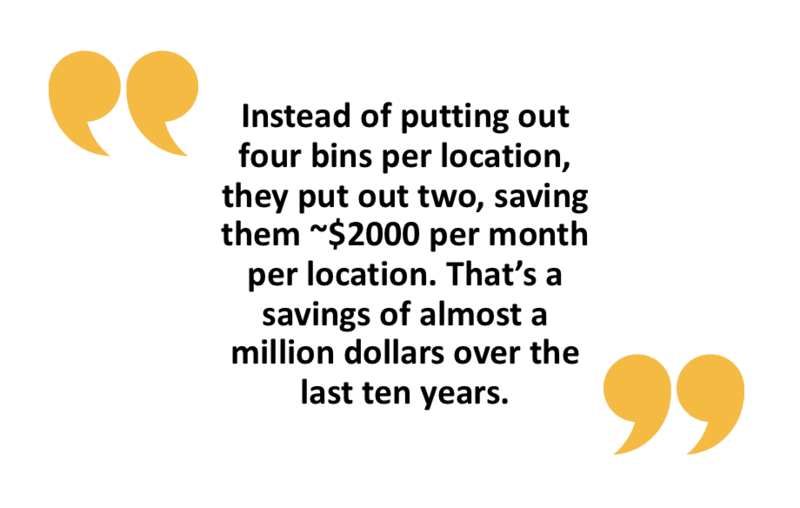 Instead of putting out four bins per location, they put out two, saving them ~$2000 per month per location. That's a savings of almost a million dollars over the last ten years. Talk about a great return on investment! David Reuter, President of USA Hostels, was so pleased with his Orwak in-bin trash compactors, he recently purchased four more. Rave customer reviews and award winning hospitality is just a few of the reasons why USA Hostels stands above the rest. Successful precycling, recycling and compacting is clearly another.